Boy, this review practically writes itself. I’ve heard Jonas Kaufmann’s Alfredo live and was duly impressed, so I was thrilled to have the opportunity to review this recording. 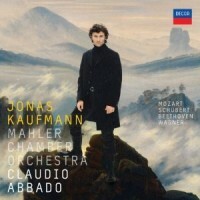 All I can say about Jonas Kaufmann: Mozart, Schubert, Beethoven & Wagner (Decca 4781463 ), to be released April 6, 2010, is that it went straight to both my iPod and home music server and has been getting heavy play while cooking dinner, driving, ironing or just hanging out. All the usual suspects are included: a little Lohengrin, Parsifal, Walküre, Fidelio, Zauberflöte. Also included are two rarely heard Schubert arias from his operas Fierrabras and Alfonso und Estrella. Let me get right to the point: Kaufmann is on his home turf vocally and it shows: he sings this repertoire spectacularly. The German is flawless; the voice rich, dark and powerful. He phrases with due consideration for the musical line and text. Top notes spread slightly here and there, but it’s so minor that mentioning it is mere quibbling. At times, the voice is so dark that it reminded me of Fischer-Dieskau, but it’s the Wagner arias that gave me chills: at times, Kaufmann’s sound approaches Vickers territory. The disk opens with two little ditties from Lohengrin: “In fernem Land” and “Mein lieber Schwan!” Both are impressively sung, but the opening phrases of the latter show Kaufmann’s true potential for handling the demands of Wagner. After some lovely and carefully phrased pianissimo singing in the first few lines, his voice really opens up during the mid part of the aria. True, this is a studio recording, but if his voice can cut through Wagner’s orchestra in a live production, Kaufmann should have a long career as a heldentenor. Claudio Abbado conducts the Mahler Chamber Orchestra with all the skill and sensitivity you would expect. Again, it’s a studio recording, so the orchestra and voice are perfectly balanced. I’d love to hear Kaufmann doing the Wagner arias live and see if the sound is as full and powerful in the concert hall as it is on this recording.